NANOSENSORS™ SSS-NCLR probes are designed for non-contact mode or tapping mode AFM. They are offered as an alternative to the NANOSENSORS™ high frequency non contact type (NCH). The SSS-NCLR is recommended if the feedback loop of the microscope does not accept high frequencies (400 kHz) or if the detection system needs a minimum cantilever length > 125 µm. Compared to the high frequency non-contact type NCH the maximum scanning speed is slightly reduced. This AFM probe combines high operation stability with outstanding sensitivity and fast scanning ability. For enhanced resolution of nanostructures and microroughness we offer our SuperSharpSilicon™ tip with unrivalled sharpness. 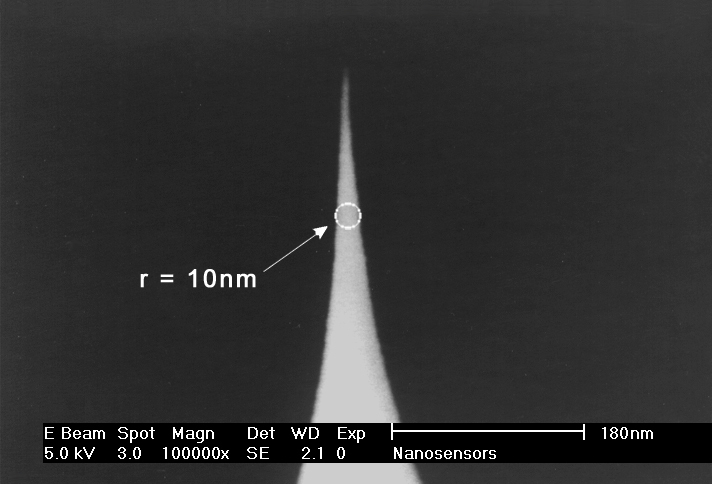 Premounted AFM probe on a Quesant T-plate for Quesant AFM systems. Based on a NANOSENSORS SSS-NCLR AFM probe. The reflex coating is an approximately 30 nm thick aluminum coating on the detector side of the cantilever which enhances the reflectivity of the laser beam by a factor of about 2.5. Furthermore it prevents light from interfering within the cantilever. The virtually stress-free coating is bending the cantilever less than 2% of the cantilever length.